ONI Bureau: Heavy rain in Odisha triggered flash floods in parts of Coastal and Southern districts under the impact of Cyclone Titli. Situation is more critical in Ganjam, Gajapati, Rayagada and Balasore districts as several rivers crossed danger mark and begins to swell due to the incessant rain. 13 blocks in Ganjam district are worst affected. Situation remains very grim in 4 blocks. River Vamsadhara in Rayagada and Rushikulya in Ganjam dists are experiencing severe flood situation due to extremely heavy rain. Rail service badly affected as a tree fell on the tracks between Ambadala and Dahikhala. Rushikulya near Purushottampur, Vamsadhara near Gunupur & Kashinagar and Bada are flowing above danger mark. Rushikulya flowing above danger mark near Aska, Sorada and Janabili of Ganjam district. 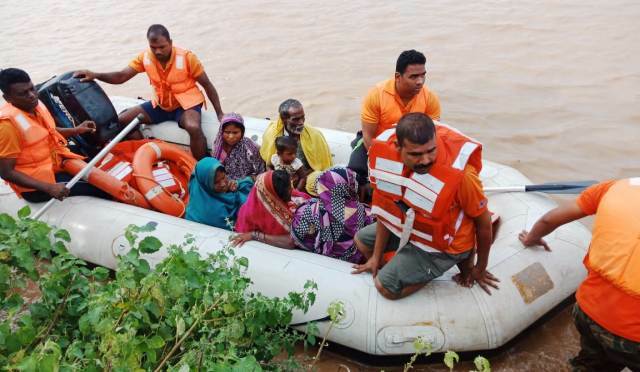 Rescue operations going on in Ganjam district, as Cyclone Titli has triggered floods in Rushikulya River. At least 193 inmates of Aska jail shifted after flood water damages main gate of the jail, ODRAF and NDRF teams deployed in Ganjam and Gajapati districts, informed SRC Bishnupada Sethi. Presently the cyclonic storm is based over Kandhamal-Angul districts & will gradually move north-eastwards to West Bengal, Sethi said. According to reports, Flood water enters into Baunsalundi, Jamapalli, Gamundi and several areas in Bhanjanagar of Ganjam district. Several villages in Ganjam marooned due to heavy rain. Water level flowing above danger mark in Bada and Loharakhandi river in Bhanjanagar of Ganjam district. Lathipada-Shergad road & bridge on Badagada Jarau River washed away due to incessant rain. Likewise, Water level flowing 6 metre above the danger mark in Jalaka river in Balasore due to heavy rain. Mahendratanaya river swells up disrupting communication between Andhra Pradesh and Paralakhemundi. Similarly, Begunia, Tangi and Chilika block of Khurda district inundated following heavy rain; water flowing at 15-feet under Jatni Railway overbridge. Road communication between Puri and Pipili disrupted due to heavy rain. In the last 24 hours, Puri has recorded a whopping 193 mm of rain. While Ganjam was the worst affected with 103.2 mm rainfall till 5 pm on Thursday. G.Udaygiri records maximum rain of 351 mm, Kantapada of Cuttack district registers 319 mm of rain under the impact of Cyclone Titli. Most part of northern and coastal Odisha including Bhubaneswar and Cuttack are reeling under water-logging as a result of incessant downpour.